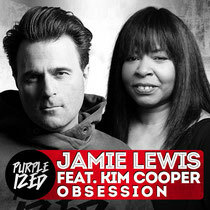 Taken from his forthcoming album, ‘Purpleized’, Switzerland’s house don Jamie Lewis is back with his latest track ‘Obessesion’. On vocals this time, it’s the powerful voice of Kim Cooper who sings the story of fantasies and sweet obsessions. The track comes in two mixes, the Jamie Lewis Darkroom Mix, which is the more commercial of the two, with big beats, a full vocal, with a very high-energy disco feel to it. Our preferred mix is the Jamie Lewis Deeproom Mix though, which as you would expect, gives the track a slightly deeper feel, whilst still keeping much of the vocal elements. It’s a decent track from Jamie, highlighting his fantastic production skills and continuous to push Purple Music as one of the original house music labels, there’s never any sell out tracks on this label. Check it out below, it’s out now.